The Canada Mortgage and Housing Corporation (CMHC) has been, and remains, an integral player in the development of urban forms in Canada. Not only does the CMHC provide recommendations for viable domestic space planning, it also promotes the use of safe, affordable, and sustainable constructive principles, and stimulates the creativity of developers, contractors, municipal officials, planners, and architects. In the same vein, the CMHC has produced numerous publications focused on social, technical, and economic research that have contributed to the enhancement of Canada's architectural culture. The planning of domestic spaces has been further advanced by Habitat magazine. The magazine served as an enlightening guide for residential architectural projects from the 1950s until the 1980s. Additionally, La construction à ossature de bois is a book that has been regularly republished since its first publication in 1967; many consider it the authority on housing construction in Canada. One could say that it is the Canadian/US Vitruvius of the North American home. Launched during the 1979 energy crisis, the National Housing Design Competition, organized by the CMHC and the Canadian Housing Design Council in 1979, fell within the aforementioned pro-active approach. The competition focused its intentions on finding innovative solutions that encouraged the densification of suburban territories and addressed looming energy concerns, while combining the elements of accessibility to individual housing with the desire for sustainable communities. During this competition the CMHC put aside its usual focus on individual homes. Instead, the organization concentrated on high-density housing that incorporated landscape and recreational amenities, while taking into account the inevitable constraints of suburban sprawl. In sum, the competition's question was: How does one design residential models that generate high-quality environments, good neighbourliness, and the enhancement of family life? George Baird was the professional advisor and the president of the jury - or more precisely the five juries since the competition spanned five regions. The regional breakdown included the Atlantic region, the Quebec region, the Ontario region, the Prairies region, and the British Columbia region. In fact, the competition was comprised of five sub-competitions, each with its own unique site. The only changing variable in the program for each competition was the requested density, ranging from 25 to 75 houses per hectare. Furthermore, the competition also strived to promote the idea of regionalism in the proposals, which indeed impacted the residential models being proposed with climatic, cultural, and historical particularities. Those two aspects, density and regionalism, were at the core of each proposal's contextual interpretation of the site. The chosen sites were seen as representative of the five regions' suburban development, which, in turn, lead to a different research perspective for each region. For example, many competitors from the Ontario region, whose site required a very high density, saw the competition as an urban composition exercise based on generative morphological innovations of public spaces, whereas the competitors from the Atlantic and the Prairies regions whose respective sites did not require a very high density, put more emphasis on the individual dwelling and its private outdoor extensions. The competition was unable to determine a winner, thus reflecting a feeling of failure. Here, the architectural potentiality resides in the competition's brief much more than in the project proposals. Comments from the jury members, divided on the priorities to be considered, illustrate the lack of consensus between "progressive" and "culturalist" trends - evoking here the still relevant distinction proposed by Françoise Choay in her studies on the history of urban planning. However, this distinction is influenced by other trends which are timidly considered by the jury: Pop Art for Sturges Donnell and Associates's project in the Prairies region, Historical Pastiche for Andrew Lynch's project, and Evolution (Grow Home Concept) for Terence Cecil's project in the Atlantic region, Ironic for James H. Jorden's project, and even Rationalist for Dunker Associates' project in Ontario. Even today, one can still be surprised by the utopian twist of the Piccaluga brothers' project in Ontario and still be awed by the sensible approach of Naomi Neumann's project, in which the meaning of amenity is magnificently illustrated in her drawings. Her drawings resemble those of Atelier Bow Wow - probably the most interesting project out of the five that were awarded a mention for Shawinigan in the Quebec region. Finally, a region that seems to stand out from the others is British Columbia. The Vancouver site is presented almost as an autonomous island, bordered by streets on three sides which form a depression in its center. The site conditions and the very high density that was required favoured very unique projects. Instead of proposing a prototype stemming directly from the site, Paul A. Gant's project, which is the only one who received a special mention for this region, rather offers an effective implementation of a conceptual model on a specific site. Examining the competition results, we see that juries were more or less selective. For Mississauga (Ontario region), eleven projects were selected out of twenty-two submissions; for Shawinigan (Quebec region), five projects were selected out of fifteen submissions; for Vancouver (British Columbia region), eight projects were selected out of fifteen submissions, for Saskatoon (Prairies region), only three projects were selected out of nineteen submissions; and finally, for St. John (Atlantic region), four projects were selected out of 17 submissions. When reading the jury comments, one can see that the submitted projects were either juried as a whole or juried while taking into account the potential of some aspects of the project for its overall benefit. The harmonization of the different juries in the five regions clearly presented some difficulties. This certainly explains the lack of positive feedback obtained by the competition at the time. A critical review of these projects is difficult because not all submissions are accessible. Here, only the selected proposals are presented. Is there a project (or more) that might have escaped the jury's attention? Would the outcome of this Monster Competition been better if young architects could have participated? According to George Baird, division among jury members was strong. He writes in the jury report's introduction "it is partly a matter of philosophy and partly a matter of generational conflicts." More generally, if some projects remotely evoke the Siedlungs by Bruno Taut in Berlin and Ernst May in Frankfurt in the thirties, while some others are inspired by the postwar new Scandinavian cities like Tapiola in Finland, none actually manages to meet the ideal ambitions of the city suburbs, such as imagined by Humphrey Carver in his famous book "Cities in the Suburbs" published in 1962. Humphrey Carver was in fact the chair of the CMHC research committee from 1948 to 1965 and was well known for being involved in his community. Attentive to the development of cities, just like Lewis Munford, very socially committed, and doubtfully inspired by the garden cities and new towns in his home country, England, Humphrey Carver saw the development of the suburbs as an opportunity to reinvent the city. His lessons have seemingly been forgotten by competitors, or they were perhaps already subject to questions raised by Jane Jacobs in her book "Death and Life of Great American Cities", published in 1961, which paved the way for harsh criticism of urban sprawl. And one must not forget that the design of Seaside, Florida began in 1979. Finally, we may regret this missed opportunity as it could have spared us these "McMansions" that are proliferating in our suburbs, which are still suburbs to this day. The 1979 National Housing Design Competition was held by its sponsors to seek excellent concepts for housing in Canada in the 1980s. More particularly, the sponsors wished competitors to address themselves to three issues which were perceived to be of great new importance for Canada. The first of these was increased density in residential neighbourhoods. Where former competitions held by CMHC had emphasized the importance of the well-designed single-family house, this competition concentrated instead on more compact densities of housing ranging from 25 to 75 dwelling units per hectare. At the same time that the competition focussed on higher densities, it was also structured to accommodate logical variations in density, which would be appropriate to the specific sites selected across the country, Saint John, New Brunswick, in the Atlantic Region; Shawinigan, Quebec; Mississauga, Ontario; Saskatoon, Saskatchewan, in the Prairie Region; and Vancouver, British Columbia. The densities selected were all established to represent what might be thought of as "medium density" for their region. The sponsors of the competition also hoped to allow for the expression of any indigenous variation in housing form which might be expected to emerge from such a regional structure. Finally, the sponsors wished to see Canadian architects respond to the new challenge of increased conservation of energy. Accordingly they introduced this criterion of evaluation into the various regional competitions, alongside the more familiar considerations of liveability in the unit, well-planned outdoor living areas, good environments for children's play, and effective site planning. The fundamental characteristic of this scheme which attracted the jury to it, was the explicitness of the architectural idea. The series of clustered groupings of terraces, ail organized around a major landscaped open space cutting across the site from east to west, struck the jury as the strongest idea evident in any of the schemes submitted in the B.C. Region. Not only did the jury find the idea explicit; they also judged that it interrelated many aspects of the design of the scheme as a whole. Access (by elevator) from underground parking, orientation (ail units facing south with outdoor living terraces to the south), clustering of units into groupings and views to the collective landscaped open space, were ail related to the basic idea of the scheme. Reservations were expressed by the jury about three aspects of the scheme. First, light conditions on the back of the terraced groupings, where the setbacks generated deep overhangs. These overhangs, some jurors felt, would create unpleasantly dark spaces underneath. Second, the terracing System adopted resulted in overlook from access stairs of some units onto the outdoor living areas of other units. Finally, jurors were concerned about the high cost of the extensive infrastructure Systems the scheme depended on. Concerns were also expressed regarding the lack of a second means of egress from many of the units on the upper levels. Ail in ail, the jury concluded that the strength of the basic idea in Submission 10 outweighed these various limitations of the design. 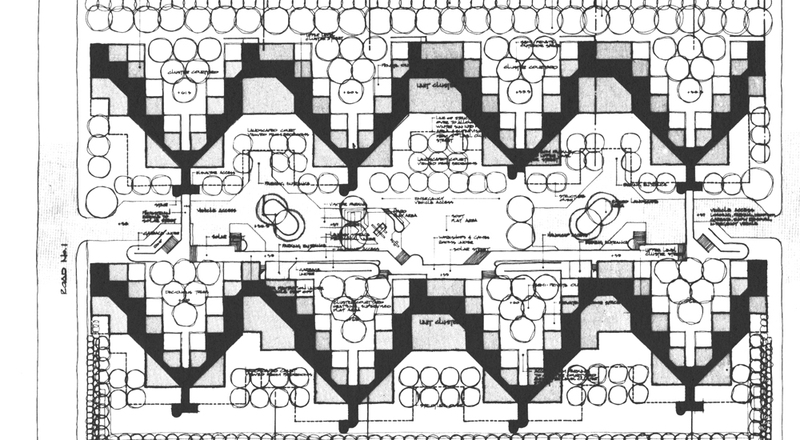 Like Submission 10, the other submission that received an award, this scheme was admired primarily for the explicitness of its basic architectural idea. The giant "bowl" which the scheme conceived, which related ail the units to the central open space spine, was regarded as an interesting concept. The jury's basic reservations were twofold. First, they did not think that the "idea" of this scheme was as complex as that of Submission 10, in that it lacked the "cluster" idea, which formed a sub-group of units within the whole. Then too, the open space spine down the centre was less explicit than in Submission 10. This also was criticized. Finally, the grid pattern of the overall site plan was thought by some of the jurors to be overly-regimented. The qualifies of the submission that were admired included the following: first, the simplicity of the landscaped open space system; second, the social focus for the project provided by the laundry/workshop area; third, the attempt (not altogether successful, in the jurors' opinion) to mix tenure types within the project; fourth, the straightforward simplicity of the unit planning (though one juror lamented the tunnel-like quality of some of the long, narrow living spaces be-tween adjoining party walls); and fifth, the effort at allowing initiatives by the occupants towards personalization of their living areas (though here again, an admiration coloured by some jurors' feelings that the outdoor living spaces provided were too small). This submission attracted the attention of the jury for its commitment to the possibility of modifications to their living environments by the occupants. In addition, the submission showed a site plan organization which the jury thought showed an interesting cluster possibility. But the jury felt that the basic configuration of buildable areas per unit was much too complicated to be effective, and that, at the same time, it precipitated serious problems of overlook and noise disturbance among neighbours. This submission was admired for the clear idea of east-west oriented stacked units it offered, relating to light, to orientation, and to control of noise. In addition, the unit planning was regarded as particularly successful. But fundamental reservations were expressed about the rather rigid quality of the sectional organization of each housing cluster and about the very tight facing dimensions of the units across the auto courts which gave access to them. This submission was admired primarily for its basic site plan organization, which grouped all the units around a large focal area devoted to active recreation for children. In addition, some jurors were attracted to the architectural expression of the scheme. But the overcomplicated building configuration, the extensive infrastructure, and the great height of the buildings proposed, were all considered to be serious drawbacks. This submission was another of the group which attempted to accommodate the entire competition in relatively low buildings close to the ground. The idea of the project was regarded as quite simple, but the jurors found it seriously "over regimented" and lacking in open space. At the same time they doubted that the complexity of the unit groupings?especially in sections?was really warranted. The jury considered this submission to have a philosophical affinity with Submission 13 which won an award. Another simple grid layout, with open space in a rough spine formation, it laid out most of the buildings close to the ground. The jury admired the clarity of the idea but found Submission 8 over-regimented, and lacking in open space like Sub-mission 6, which won recognition. At the same time, they found the sectional organization of the dwelling units, from foundations right through to roof forms, unrealistically complex and costly. The jury had some regard for the general architectural character of this submission and they liked the idea of the relationship of private to collective landscaped open space. They were disappointed in the back-to-back unit grouping, and thought the site planning looked too random in execution despite their regard for the idea. They also concluded that the staggered forms of the unit groupings were structurally incompatible with the system proposed for underground parking. The various submissions to the competition were all received in Ottawa in early June, and were reviewed by their respective regional juries throughout the following weeks. IMPORTANT NOTICE : Unless otherwise indicated, photographs of buildings and projects are from professional or institutional archives. All reproduction is prohibited unless authorized by the architects, designers, office managers, consortiums or archives centers concerned. The researchers of the Research Chair on Competitions and Contemporary Practices in Architecture are not held responsible for any omissions or inaccuracies, but appreciate all comments and pertinent information that will permit necessary modifications during future updates.